Luiz Inacio “Lula” da Silva, the hugely popular but jailed former Brazilian president, has withdrawn his candidacy for the country’s top seat ahead of a general election next month. Lula, who is barred from running in the October 7 vote due to a corruption conviction, stepped down on Tuesday as the leftist Workers Party (PT) nominee, the party said in a statement. Fernando Haddad, Lula’s former running mate, was named as the PT’s replacement presidential candidate. The PT’s announcement was made outside the police headquarters where Lula is imprisoned in the city of Curitiba, in southern Parana state, just hours ahead of a 7pm local time (22:00 GMT) cut-off point for the PT to name a substitute candidate. Following the announcement, Lula called in a post on twitter for his supporters to back Haddad’s bid for president. Por isso, quero pedir, de coração, a todos que votariam em mim, que votem no companheiro @Haddad_Fernando para Presidente da República. Translation: So I want to ask you, from my heart, to everyone who would vote for me, to vote for the Comrade @Haddad_Fernando [Fernando Haddad] for President of the Republic. Tuesday’s deadline was set by Brazil’s top electoral court when it ruled at the beginning of September to ban Lula’s candidacy under the country’s “Clean Slate” law, which forbids people with serious criminal convictions from standing for office within eight years of them being found guilty. The 72-year-old has appealed to the Supreme Court to have the judgement overturned. Lula could plausibly still run as a candidate if the Supreme Court reverses the electoral court’s decision, with the latter scheduled to conduct a final review of all nominees and outstanding cases related to the election on September 17 – though analysts suggested to Al Jazeera that this was improbable. 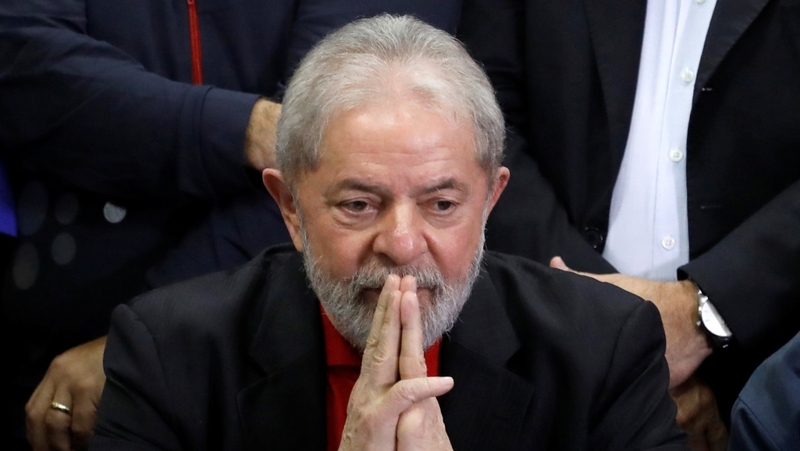 Professor Francisco Panizza, a professor in Latin American and comparative politics at the UK’s London School of Economics, said it was “very unlikely” Lula’s ban would be rescinded. “The rulings have been extremely consistent … there is a clear line within the judiciary that Lula should not be able to stand,” Panizza told Al Jazeera. “The court will have such a radical break [if it overturns the ban] with what lower courts have consistently ruled over the last year,” he added. Born in rural northeastern Brazil in 1945, the charismatic Lula rose through trade union politics and PT circles to serve for two terms as the country’s president from 2003 to 2010. He left office with personal approval ratings approaching 90 percent. But his image as a working-class hero was rocked in July 2017 when he was sentenced to nearly 10 years in prison for accepting bribes totalling 3.7m reais (approximately $900,000) from Brazilian construction company OAS while in office. He has consistently protested his innocence, alleging the charges were politically motivated. Despite the controversies, Lula has topped recent opinion surveys gauging presidential candidates’ popularity levels. Polling published last week by research institute Data Poder 360 showed between 33-37 percent of voters intended to vote for Lula, if he were allowed to run. His enduring appeal is owed, in part, to an economic boom which occurred during his time in office and his “key role” in every election since Brazil’s transition to democracy in 1985 after two decades of military rule, Oliver Stuenkel, a professor of international relations at the Getulio Vargas Foundation (FGV), told Al Jazeera. Lula’s presidency coincided with poverty rates falling by more than 50 percent in Latin America’s most populous country, according to FGV, a Brazilian higher education institution specialising in economics and business. “The question [now] is to what extent he can transfer votes to Haddad,” Stuenkel said. “This week is really decisive, and it will emerge whether Lula waited just a bit too long [to renounce the candidacy] and whether he should have taken that step earlier in order to allow Haddad to create his own recognition,” he added. Support for Haddad among voters is currently hovering at about nine percent, according to data published on Monday by polling agency DataFolha. 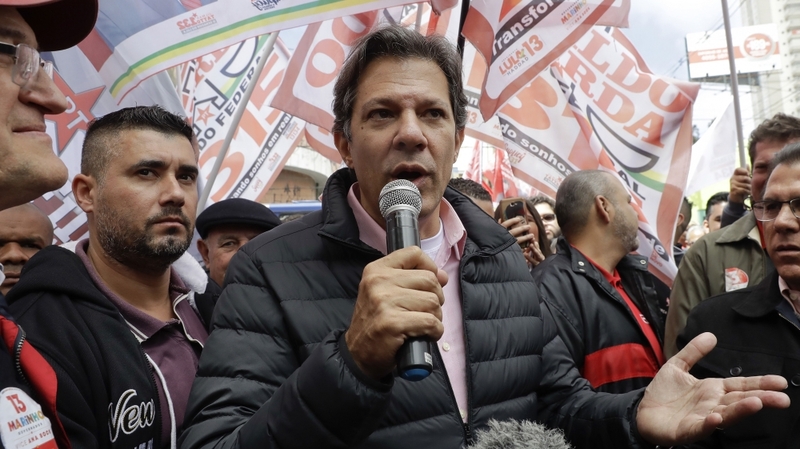 Prosecutors charged Haddad last week with corruption over donations made to the PT by representatives of a construction conglomerate to allegedly cover debts accrued while he was campaigning for mayor in Sao Paulo in 2012, an election he won. His candidacy is unlikely to be blocked, as there appears to be insufficient time for a trial to take place before the elections, but the accusation could prompt a backlash from voters weary of multiple corruption scandals in recent years. Since 2014, more than 150 business leaders, multinational corporations and politicians – including Lula – have been arrested or prosecuted as part a major corruption investigation known as Lava Jato, or Car Wash.
Haddad, 55, is expected to face a struggle to close the gap in support between himself and Jair Bolsonaro, a far-right frontrunner candidate who is projected to win between 24 and 30 percent of the vote, according to recent polls. 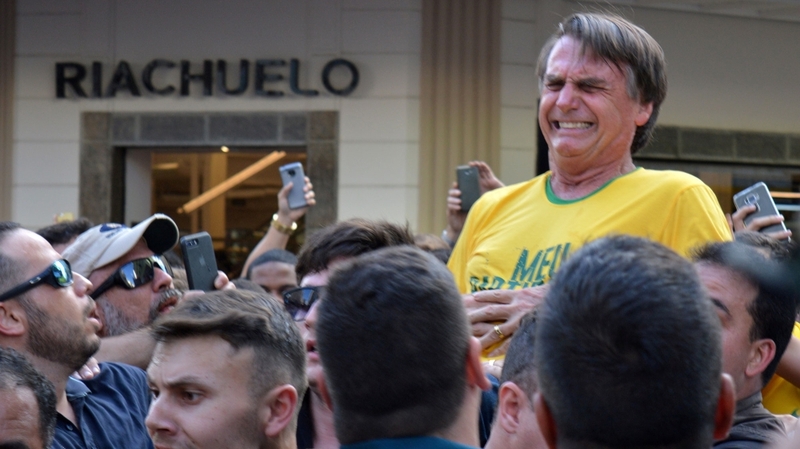 Bolsonaro’s popularity appeared to grow in recent days after he was stabbed while campaigning in the city of Juiz de Fora, in southeastern Minais Gerais state, on Thursday. “The PT’s narrative is that Lula is the victim, but the problem is that since last Thursday, there’s another victim,” Stuenkel said. “The hottest story in town is no longer Lula not being allowed to participate but it’s an assassination attempt against the leading candidate [Bolsonaro],” he added. Brazil’s electoral system requires a candidate to win a majority vote – 50 percent plus one – to secure an outright victory. If no such result is returned in the first round, a second ballot featuring only the top two first round performers will be held two weeks later, on October 28. It remains unclear whether Bolsonaro, 63, will be able to resume campaigning ahead of the first round having undergone surgery following the attack. The Rio de Janeiro Congressman’s sons, Flavio and Eduardo, are campaigning on his behalf while he recuperates. Bolsonaro, a member of the Social Liberal Party and a former army captain, has pledged to crack down on corruption and spiralling violent crime rates in Brazil, which is home to more than 210 million people. He has also attracted widespread criticism for making numerous controversial statements over the years regarding race, gender and sexual orientation, with analysts predicting he will prove too divisive among voters to win the majority-support required to take office. According to Panizza, there is a “very good” chance Bolsonaro will attract enough support to top the first round, however, and force a second vote. “The big question is, who will be competing against him [Bolsonaro] in the second round,” Panizza said. “In short whoever wins the race for second place in the first round is very likely to be the next president of Brazil,” he added. The country’s last four presidential elections, from 2002 onwards, have all gone to a runoff vote. More than 20 percent of the electorate are either undecided about who to support or plan not to take part in the vote, according to DataFolha’s poll, despite participation being compulsory by national law. A 2017 study by Latinobarometro, a Chile-based polling group, found that only 13 percent of Brazilians are satisfied with democracy.